We have completed many large and small construction projects in Sydney, Central Coast, Newcastle, regional NSW, Queensland and South Australia. Our highly skilled team of Plumbers, Foremen, management, estimators and administration staff ensures that in all projects we’re engaged in we consistently deliver a superior and reliable process to meet all types of budgets and programs. We have experience with both “Design and Construct” and “Construct only” projects. J.M. Cleary Pty Limited provides all clients with documented evidence of our Standards and Quality Management Systems, including our Occupational Health and Safety Policies, Site Safety Rules, Quality Plans, Inspection and Test Procedures and Checklists that meet the requirements of the Building and construction Industry. 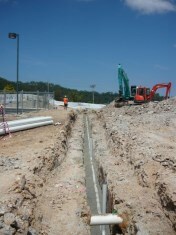 The project consisted of the construction of 120 bed specialist care facility located north of Wyong NSW. 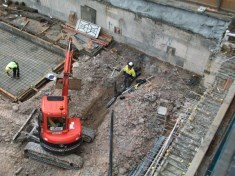 The entire construction was slab on ground which required extensive in ground services. A complete new design and construct project consisting of a 150 bed nursing home. The project involved the construction of a new pork processing wing to adjoin the existing meat packing plant. The project was extremely technical and required a very high level of management to deliver a very high quality end product. The construction of a new 110 bed boarding house, located on the Wahroonga Campus. This project was completed in 2 stages. It consisted of the demolishing and rebuilding of the existing Emergency department and the construction of the new surgical wing. The whole project was completed around the normal operations of the existing hospital. The complete new construction of a free standing Mental Health unit within the Gosford Hospital site. The project included the construction of a 3 level science block and new full size indoor basket ball gym and a new library. The project consisted of 2 basement level carpark, ground floor retail and radio station and 6 levels of residential home units. A new construction of 18 hostel villas with medical and meeting rooms. 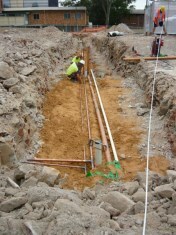 This project consisted of the installation of all inground stormwater, sewer main, fire and water main services. A construction of a new COLES store on the main street of Narrabri. Project consisted of the remodeling of the heritage wing and the modification of patient and staff rooms within the main building. The main building remained operational during the construction period. 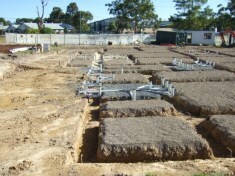 Complete new construction within an existing Ausgrid site. A highly specified project which was completed to exacting standards. We offer only Quality Workmanship, Prompt Efficient Service and the Ability to meet your program requirements. We look forward to being of service to you on any upcoming projects.